Welcome Miami County to e-filing! Now is the time to get your service contact attached to your cases. On Friday, March 15th, Miami County joined the list of counties in the Indiana e-file system. This is just a reminder that if you have open cases in any of these courts now is the time to use our batch service contact attachment feature to get your preferred service contact attached to all your cases. In addition to finding your Miami county cases, this will catch any other open cases you may not have your private service contact attached to yet in any e-filing county. Welcome Putnam County to e-filing! Now is the time to get your service contact attached to your cases. On Wednesday, March 13th, Putnam County joined the list of counties in the Indiana e-file system. This is just a reminder that if you have open cases in any of these courts now is the time to use our batch service contact attachment feature to get your preferred service contact attached to all your cases. In addition to finding your Putnam county cases, this will catch any other open cases you may not have your private service contact attached to yet in any e-filing county. Name That Debtor! Making sure your lien can be found in the e-filing world. Part 1. This information is particularly important for anyone filing a Collection, Tort, Plenary or Mortgage Foreclosure case that might result in a lien on property. Getting a judgment is often easier than collecting it, but with some attention to detail at the time you file, you can significantly increase the chance that your lien is quickly found by title searchers so it will be satisfied during any subsequent sales process. 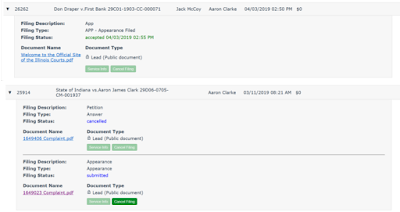 The problem is that filers often name the defendant in a manner that makes it hard for title searchers to find the case. As an attorney, you are careful to be precise about party names from a legal perspective. However, once you have obtained a judgment, the party names become an index for researchers. Here's the problem that creates: Let's suppose you are filing a mortgage foreclosure against the estate of Elmer Fudd and the heir he is rumored to have. You carefully enter the defendant as "The Unknown Heirs and Estate of Elmer Fudd, Deceased". However, when the heir decides to sell the house as part of wrapping up the estate, the title searchers are searching on the name "Elmer Fudd", and since that's not the party name, they can't find the case. Now the sale goes through without the defect being noticed. It may be possible to collect from the buyer or the title insurance company, but it's going to be a mess no matter how it plays out. This mess can be avoided with about 10 seconds of extra work. Simply add a party to the case during filing with the name "Elmer Fudd" and a role of "Decedent". Now a researcher charged with finding any defects on Elmer Fudd's title will be able to find the case with a single name search. This is useful in any case where the judgment may become a lien. Regardless of the legal terms you use to precisely describe the defendant, make sure you also create a separate party record for the name of every owner of the property you will be creating a lien on, using only their name, so a complete index for finding the judgment is created. Note: Any careful title researcher will use the Doxpop system to search for judgments, and if they use our "simple search" feature, a search for "Elmer Fudd" will immediately find a case that refers only to "The unknown heirs of Elmer Fudd". We've solved this problem for any researchers that use our system. However, you can't be sure that they will use our system for doing the research, so this little extra step protects your investment in obtaining the judgment. Welcome Wayne County to e-filing! Now is the time to get your service contact attached to your cases. On Friday, March 1st Wayne County joined the list of counties in the Indiana e-file system. This is just a reminder that if you have open cases in any of these courts now is the time to use our batch service contact attachment feature to get your preferred service contact attached to all your cases. In addition to finding your Wayne county cases, this will catch any other open cases you may not have your private service contact attached to yet in any e-filing county. Clinton and Pike Counties Convert to Odyssey- Your Doxpop Access is Unaffected. During the weekend of February 16th, the Courts in Clinton & Pike Counties will convert to the Odyssey case tracking system, this means their Case Management System is now administered by Indiana Trial Court Technology. This move does not affect Doxpop users because Doxpop buys access to a real-time feed of court data from the Odyssey system from the Division of State Court Administration. Your access to Clinton and Pike County court information through Doxpop will not be interrupted during this transition. 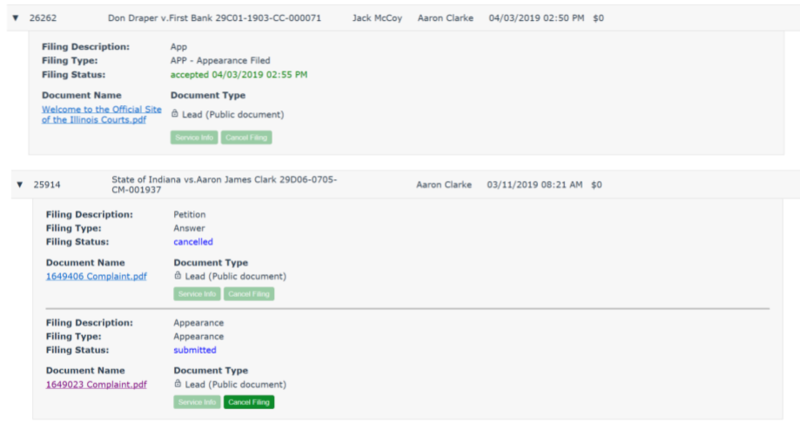 If you use the personal calendar feature to keep track of hearings connected to your Bar ID, you will see two colors for Clinton or Pike County on your calendar. Every event will be available, but the older cases will have a different color from the newer cases. When we complete the merge process, these will go back to being a single color. If you use any of our "watch" services to keep an eye on cases or people of interest, we will be moving those watches over so they point to the cases and people that are a part of the Odyssey data feed. We run a process to convert these every hour, but it is possible for notification of events to slip through the cracks between conversion runs so you may want to periodically do a manual check between now and March 19th. After then, we'll be back to normal.